We’re getting towards the mid-winter holidays. 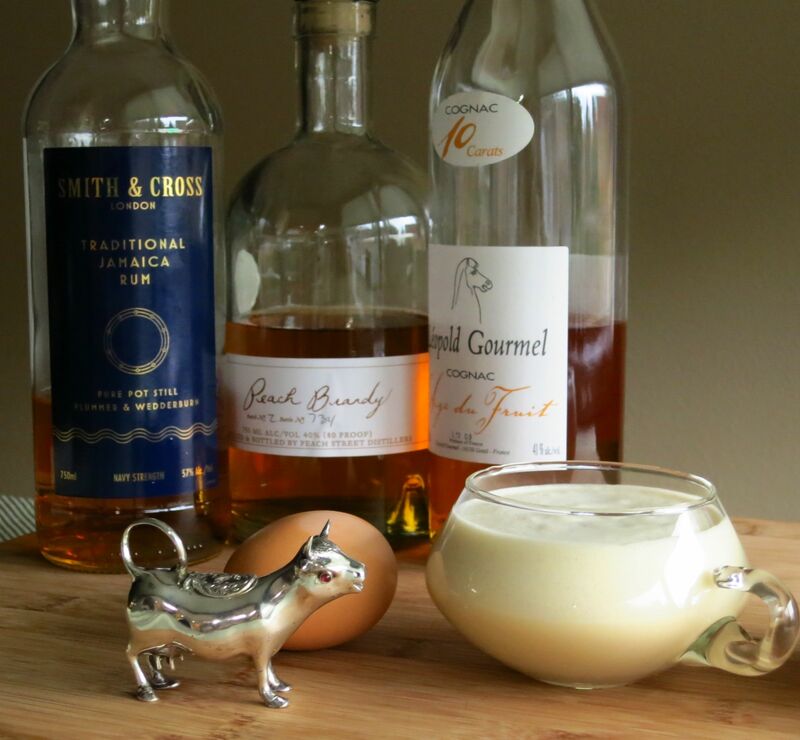 If you like richer drinks, especially those with egg in them, now’s the time. Fortunately, there are lots of traditional recipes that can be turned to for inspiration in this area. We decided to peruse David Embury’s book, The Fine Art of Mixing Drinks, and see what we could find. 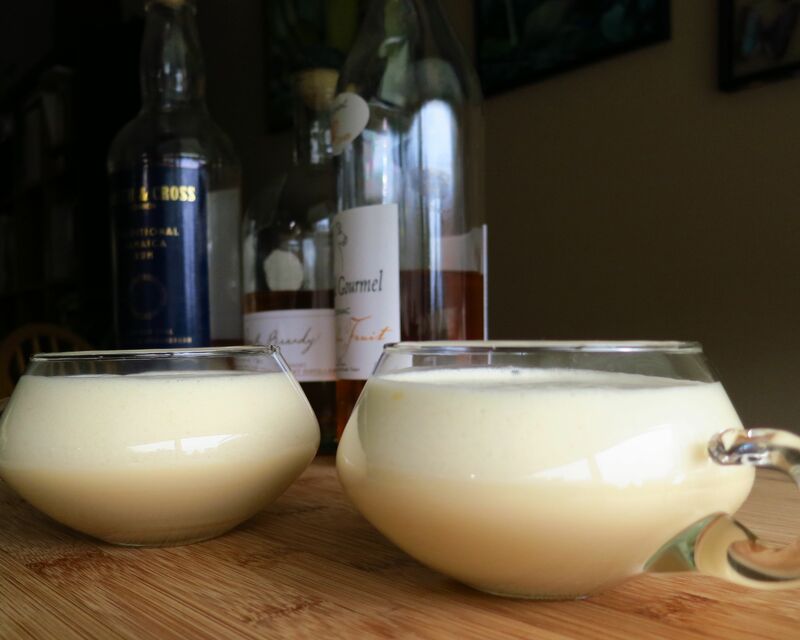 Once we had gotten the lay of the land, we decided to go with an egg nog, since that’s a classic this time of year, and a posset, which is an old style of drink combining heated ale or wine with milk and/or egg. We were intrigued by this one because of the use of peach brandy, kind of an interesting spin on the traditional flavor profile and not something you’d normally expect to find in eggnog. Separate the egg. Beat the egg white to stiff peaks. Beat the yolk into a foam. Add the liquor slowly to the yolk, stirring constantly, then do the same with the sugar. Stir in the milk and cream and, finally, fold in the egg white. It may look a little lumpy at first, the lumps will melt away after a few minutes. Nose: Predominantly nutmeg, then rum and subtle dairy notes. Palate: Creamy foamy start with lots of richness from the egg yolk and cream. Funkiness from the rum along with peach notes on the mid-palate. The cognac provides a solid flavor underpinning throughout. Fairly sweet and very rich. Pretty boozy too, it would probably be easy to get plowed on these 🙂 Normally Christa is not a fan of eggnog, but she really likes this. We had never made a posset, and so were quite curious about them. Traditionally they are made by heating ale or wine and stirring in milk, then straining the curdled result and adding spices and other flavorings. There is also a variation where egg yolk is substituted for milk, and we decided to give that one a whirl. Beat yolk to a froth, then beat in the sugar and spices. Heat the wine to boiling point and pour slowly into the egg mixture, stirring constantly. Serve at once. This recipe originally called for dry white wine. 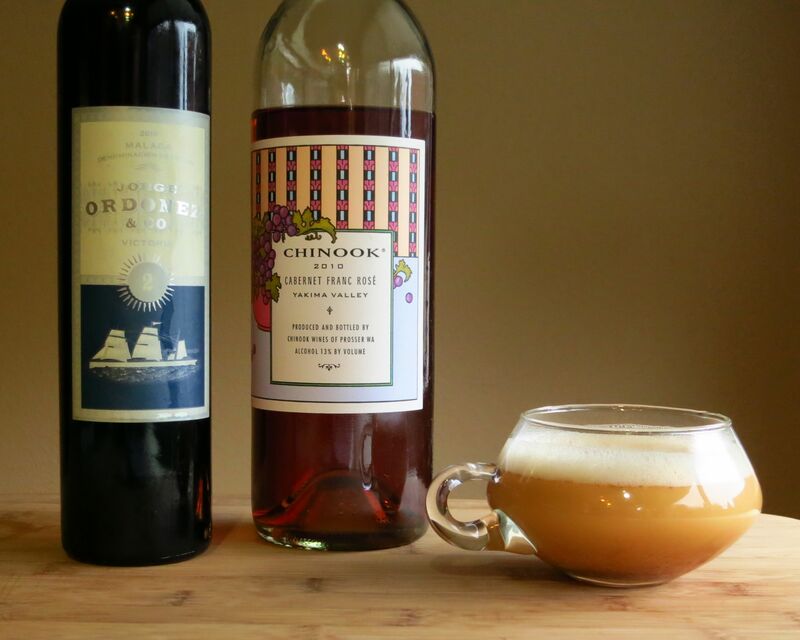 We substituted rose wine plus 1 oz sweet fortified wine to add a little more complexity. Nose: Spiritous notes from the wine, cinnamon, allspice. Sweet creamy smell reminiscent of vanilla pudding. Palate: Fruit on the front from the wine, with cider and tart cherry notes. The spices come up strongly on the mid-palate. Long, dry, somewhat tannic finish. Drier than expected overall. Very pleasant and warming. Similar to a mulled cider, but with more body. We were both pleased with the results of our research, and hope this will broaden your horizons as well. Certainly, we now feel like we’ll need to try a milk posset, and a flip as well (like a nog, but no dairy). Here’s to future experimentation with the humble egg! This entry was posted in cognac, cream, egg, jamaican rum, milk, peach brandy and tagged eggnog. Bookmark the permalink. Pretty sad I didn’t make any nog this year. But on the other hand I never knew what a posset was. Awesome job ya’ll. What’s stopping you from making it now? 😉 The Baltimore is pretty nice even if it’s unaged. Glad to be of service. Thanks!